As I mentioned in this post several weeks ago, when writing with an intimate point of view (POV), we should avoid describing anything that the focal character would not notice. We are trying to show the world through the eyes of this character, so describing something that he or she isn’t paying attention to wouldn’t be natural. The character doesn’t really “see” it. In that post, I provided a couple of ways to get around this obstacle with regard to familiar objects, but I neglected to mention ways to describe characters the POV character knows well. Think about it. When you come upon someone you see every day, how often do you take notice of that person’s eye color, nose shape, hairstyle, etc? If you’re like most people, probably not often, perhaps only when something happens that highlights the feature–the person gets a radical haircut, breaks her nose, or wears glasses for the first time. Then you would be more likely to notice physical features. In a story, if nothing happens that sparks the POV character’s notice, it would be odd for the data to come through the character’s sensory channels. True intimacy is achieved when you write what the character notices about a person and also avoid writing what the character wouldn’t notice. Shanghai stood next to me below my apartment. Early morning sun shone on her from the alley opening. The light revealed rips and bloodstains at the elbows and knees of her Reaper ensemble—forest green pants; black shirt and running shoes; and cloak, its hood pulled back, revealing an oozing gash on her forehead. The damage, along with the surrounding broken beer bottles and other alley trash, made her look like she had been in a bar brawl. Although dirt marred her Asian features from chin to scalp, and tangles mussed her ebony hair, she radiated beauty from the top of her lovely head, down her athletic, toned body, to her sleek legs. She was the model of feminine perfection. Describing the POV character can be even more difficult. If the character isn’t aware of any of his or her own appearance changes, no physical descriptions would come through that character’s sensory input. 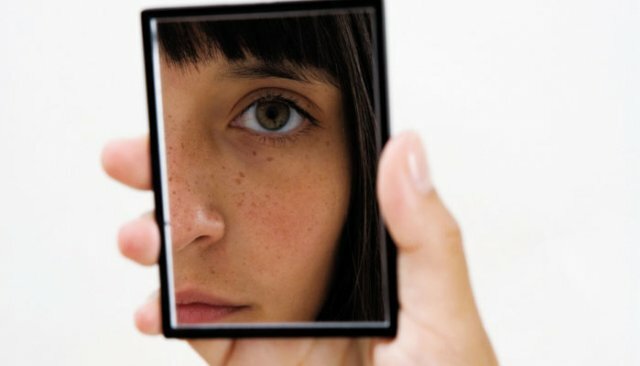 Many writers use what is sometimes called the “mirror trick,” that is, the character looks in a mirror, giving the writer an opportunity to tell the reader the character’s physical traits. The first problem: unless there is a compelling reason for the character to look at a mirror, experienced readers will recognize this as a trick. In other words, if you want to use the mirror trick, you need a reasonable motivation for the character to check his or her reflection, perhaps to examine a bleeding wound or to try to get a foreign object out of the eye. The second problem: even when looking at a mirror, a character wouldn’t usually notice the details that he or she has seen thousands of times. In order to report them, you might have to employ some of the same methods I mentioned above–bloodshot eyes, misaligned hair, etc. Hair wetness can cause a character to notice that her hair is a darker shade of brown than usual. New clothing can have bright colors that cause notice of matching eye color. Exhaustion and thirst can raise awareness of cracked and/or dry lips. If, however, you are not trying to employ an intimate point of view, you need not be concerned about these issues. Go ahead and say that the character has brown hair, blue eyes, and stands six feet tall. It’s a lot easier. Yet, although intimate point of view is far more difficult, it yields a huge benefit–putting readers inside the skin of the POV character, which results in a more emotionally impactful, intense, and thrilling experience. I hope this helps. Feel free to ask questions or comment on how you have described characters in a natural way while writing with an intimate point of view. Hopefully this isn’t too confusing. What if, for example, I have two characters, Bon and Sarah. If it is part of Bob’s personality that he talks a lot about just about anything and everything, and Sarah is only just meeting Bob, then it would make sense to include the words she hears Bob say. I want to include examples of how Bob acts and his talkative personality, however, I don’t want to fill my book with pages of dialogue of nonsensical rambling that doesn’t contribute to the overall plot. How do I handle an intimate POV characters observations of Bob’s actions without putting lots of filler in my novel? I would provide a short, real-time example of his chatter and summarize the rest. Thank you, that helps! One other question. If I am describing the way a character walks, from another person’s POV (say Bob observing Sally), is it okay to use the same word multiple times? One of my book characters always moves around with a quick purposeful walk, basically she strides around almost everywhere. Stride fits how she walks, but would it become too repetitive and trite to keep using it, or is it best to keep it? It depends on how much gap you have between uses of the word. That’s a judgment call. Can I write something like. “Cameryn’s emerald eyes glared at me?” or would that take away from the intimacy and if a certain character likes another character do you think it would be realistic to notice eye color, hair color, thinks like that? It would be natural if the eye color is more noticeable than usual for some reason, especially if one character isn’t around the other very often. Or maybe the light source causes the eyes to be more noticeable. If one character is becoming more attracted to another, then it is natural to notice physical characteristics. Do you think it’s necessary for the reader to know the physical characteristics of your focal character? Or can you just sort of gloss over those details? It is not necessary. Give a couple of features and allow the reader to fill in the details. I received “Beyond the Gateway” today in the mail! Thank you, Mr. Davis, for the book and for the autograph. I will probably be starting the book this afternoon or tonight. There it remarks that her dress is new and violet, and it can be assumed that it is large or flowy, as it gets in the way. But, the question is, is this an acceptable description from one person’s point of view? I do this a lot in my stories, trying to describe without describing, but I’m beginning to wonder whether it’s even alright to do this?